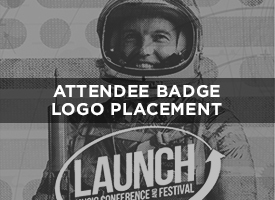 WHAT IS LAUNCH MUSIC CONFERENCE? LAUNCH Music Conference is a developing artist music conference, taking place annually in Historic Downtown Lancaster, PA every April over three days and three nights. LAUNCH is both education and performance centered. All artists who submit for one of over (200) performance spots are invited to attend LAUNCH and given complementary weekend badges. This badge grants free access to the full daytime program and free entry to all non-marquee showcases at night, with a 50% discount on marquee performances. Attendees can expect 12+ hours of music education. This year LAUNCH will be celebrating its 11 year anniversary. Over the years LAUNCH has brought in thousands of attendees and hundreds of panelists, coming together to share their knowledge and love of the music industry. We can't wait for you to see what we have in store for 2019. From 10AM to 4PM on Friday and Saturday, more than 40 industry professionals educate prospective music industry workers and bands on a variety of topics, from deal structures to content creation, social media and tour booking. Panelists come from the most respected agencies in their fields, and some are members of internationally-acclaimed bands. For three nights, LAUNCH's performing artists take to the stage and showcase their music across the city. 220 unique performances took place in 2016 across 17 stages, all conveniently located within a five block radius in the heart of downtown Lancaster. There are stages indoors and outdoors, including in historic Penn Square, and in many popular downtown bars, restaurants, and clubs, in addition to the Lancaster County Convention Center. Though LAUNCH was established as a developing artist conference, the festival has hosted numerous well-known artists, blended into the nighttime programming as Marquee Events, to raise the profile and general awareness of the festival. LAUNCH hopes to host artists both on their way to the top, and again once they have reached the next level. Our 2011 conference received a submission from (and subsequently placed) a virtually unknown act from Ohio who would rapidly ascend to greatness and renown - Twenty-One Pilots. Every LAUNCH Attendee receives a jam-packed Attendee Bag when they retrieve their credentials from the LAUNCH Registration Booth. Items are of your choosing (you provide), from a simple flier or coupon, to a unique promotional item of your choosing (up to 2,000 items). A great way to “greet” our guests and familiarize them with your brand for an extremely low price. Every LAUNCH Attendee Bag includes the 2019 LAUNCH Music Conference & Festival 2XCD compilation, featuring some 40 artists performing on a LAUNCH Stage in 2019. This is one of the most recognizable annual promotions. $500 for a full page ad. $800 for a full page ad. Included in our Gold & Platinum level packages, we offer also offer this option “a la carte”. Every Attendee will see your brand’s logo on their personalized conference badge. Name and Brand a LAUNCH Performance Stage in your brand’s name. This stage is printed on all signage, in the conference guide, and used on the website. Banners on the stage, as well. Prices vary by Stage, from as low as $750 to $2,000. 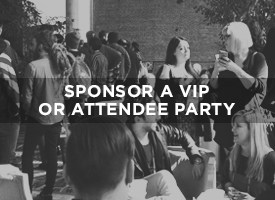 Stage Sponsorship is included in our Platinum Level Sponsor Package, as well. These are first come, first served, while opportunites last. *contact us to design a stage sponsorship. Whether (2), or (10) banners (you provide), see to it that your brand is highly visible in some or all of the highest traffic areas at LAUNCH 2018, in Conference areas, and Festival Performance areas alike. Options are 2’X4’ banners up to 3’ by 6’ banners. There are volume discounts for 3 or more. LAUNCH hosts several gatherings for both Invited VIP guests, and for all Conference Attendees. Make your brand a presenting sponsor, listed on all signage, in print guides, and one the website, where each and every attendee is made aware of your brand, and made to take note of the graciousness of our presenting sponsors.